The solicitors have welcomed her agreement to be part of the legal team. 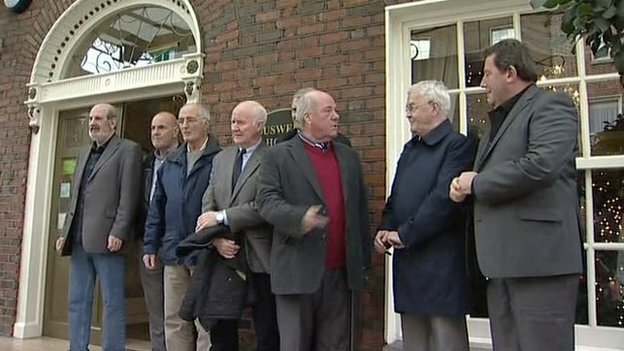 “The case of the ‘hooded men’ is one of the most significant judgements in human rights history,” said solicitor Darragh Mackin. 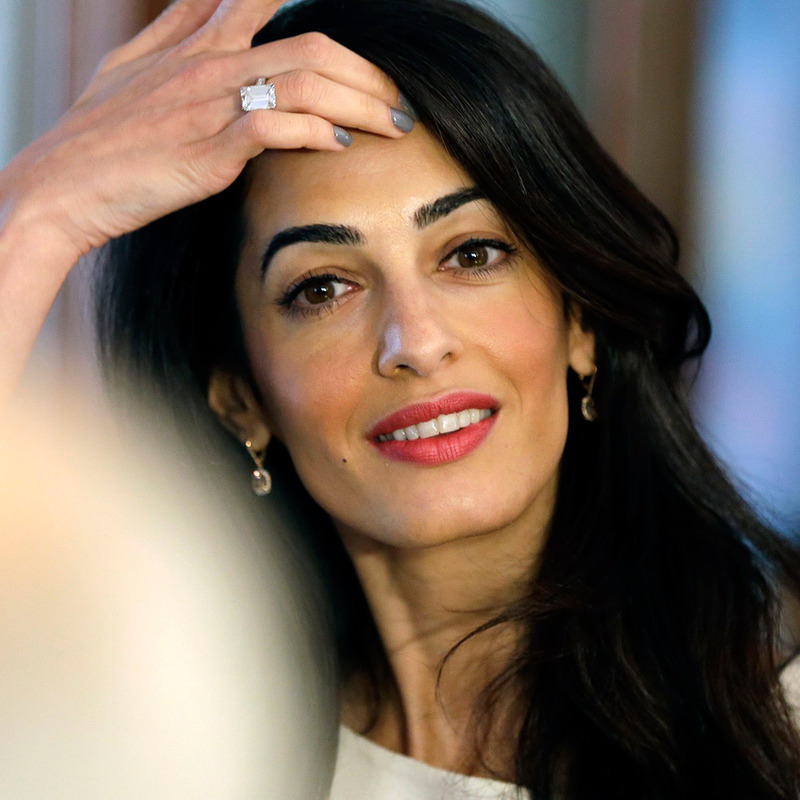 “We think Amal’s track record speaks for itself, as do all of the counsels’ CVs in this case. It is an extremely rare application, an interstate case before the European Court. Can you not all see everyone is using her to bring publicity to their cause? She is a pawn. A very immature and junior nobody lawyer. Geoffrey Robertson, Jennifer Robinson and the like, are real intellectual legal giants. Amal is just a woman that spends hours in the gym, eats rarely, has plastic surgery, is very high maintenance, spends hours trawling through fashionable labels to find the right clothes to wear… Cannot be taken seriously. But she is so vain she won’t realise others are using her – she’ll be flattered. Too funny. And sad. Don’t be too hard with her. She is an accomplished lawyer and her style is never boring. The celebrity factor is not easy to support. I will not publish your next comments if they are in the same style. You could say that you don’t appreciate her or hate her, so it is enough. Hey Cynic, you have just described YOURSELF!! It must be because such unreal description you just gave is not of Amal! The trouble i present you after reading your trolling garbage is that unfortunately for you, such description is just a fantasy in your wildest dreams. So keep looking at the mirror and vomiting your self hate because you will never be even Amal’s shadow! But hey, dont kill yourself! This is a classy blog. if you can’t live to this standard, then LEAVE!! go spread your negativity somewhere else and lets see where that takes you. And you are so smart!! did you discovered all this by your self!!? Agreed. Smart, accomplished, beautiful, iindependent and most likely kind. If I had a daughter, I would want one just like her. And I would want to borrow her clothes! Cynic…we all know they can now all use her celebrity and so does she. But we also recognize that for 36 years, she was an unknown private person that advanced herself and was hired by this prestigious law firm…junior or not. And she WAS involved in her firms cases before she knew Clooney. That says volumes, she is intelligent. And she loves fashion, obviously. You can do both. I don’t think there is anything wrong with her having fun with her new status and recognition. I do concede though, that it does undermine her seriousness as a lawyer…..to the public only, when she wears some of the things she does. But that doesn’t mean that in private she is taken seriously by her coworkers. I’m sure she is, or they wouldn’t have hired her. Precisely Lulu. You don’t get a tenancy at Doughty Street if you are an intellectual light weight. There is intense competition for these positions. And she had that position and was was fully engaged in her case load before she even met Clooney. She won her tenancy by ability. It is true that she is relatively junior – especially for her age – but that is because she had a previous career in corporate law before becoming a barrister specialising in human rights. I am also sure she us very aware that she is now an international spokesperson and is sought out by clients wanting attention for their causes. She is far too intelligent not to understand what is happening. As to criticising her for looking fantastic – well, that speaks for itself. Anyone who has ever worked in a lawyer’s office (like I do) knows that it’ s the junior lawyers, like Amal, who do all the work and the senior lawyers like, Geoffrey Robertson, show up and claim the credit. Amal would have been the one to do all the drudge work, like the written submissions on the Armenia or Greek case. So, no, Robertson is not holding her hand. If anything, he enjoys the publicity more than she does. Why do people hate any woman with a brain? i read the article. very well written. As for “why people hate any woman with a brain?” all i can say is that from what I’ve saw, its mostly women how like to put down other women. Can you imagine if women supported each other instead, we would’ve ruled the world! Totally agree with you Clara. Often it seems other women are first online to trash another. Really sad! I think it is low self-esteem that does that. What these offensive impolied comments from Cynic..if she was not competent in her work she would not work in the best law firm in the world.As for her private life you are not supposed to involve yourself in.It is none your business.I would like to know what is your study level and which position you are holding(if any).Finally keep these comments for yourself and take care of your daughter. JS, Cynic is ….just Cynic…. envious to the bone, hateful, bully. Not even worth it to wast our best speech with such a nonsense person. Amal for sure is more than Cynic will ever be. That must hurt on someone with such self hate! Pity on you Cynic! I will delete Cynic comments … just a shame and so hateful. i agree some of the comments above- amal is smart, beautiful and love her style, thank you for writing the blog – it’s very inspiring. thank you nati for this blog, i check it frequently but this is the first time i write in. however, i think you need to be a bit more open minded, the minute anyone criticizes amal you get all defensive and say that you may not publish their comments again. I don’t believe in censorship, as long as people are not using hateful or offensive language, they should be allowed to express their opinion be it negative or positive! otherwise it feels uptight to have someone deleting comments the minute anyone says critical, you might as well not have a blog and exchange then! i hope you take this constructively, this is the real world after all, noone in the limelight will get positive coverage all the time! It would be last time that you see such hateful comments …. What a pity Nati that you threaten to censor someone who adds a critical remark or post to the discussion. You devaluate your own blog by deleting them. Where are we here, in fairy tale land where everything has to be exclusively positive and cute, and if life is only stylish we’ re all good? Also you’re repeated remarks “if you don’t like Amal why are you in this blog?” are not very appropriate for a public blog. Please accept that there are critically thinking people who analyze these dynamics of publicity with a sharp eye, that is important. Hint hint: Your beloved Amal would probably appreciate that there are critical women out there. Don’t delete people’s comments like the one from cynic, your harming only the value of your own work. Thanks by the way for all your efforts, I like your blog, including very much all the crucial posts. Dear Claudine, I accept constructive comments. You can say that you don’t like her jacket or dress, but in a respectful way. Hateful comments will be deleted in the future. There are enough rubbish comments on other sites (with fake stories about divorce, anorexia, jealousy, etc …) which are not moderated. She has success career as lawyer, a wonderful husband who loves her, she is clever and can be funny, and finally she has lot of money and is beautiful with a great sense of style. So jealousy could be normal. Usually, I accept the majority of the comments and I made also some critics, but always respecting the rules. Emily I completely understand and agree with you. however, this is not a gossip site, newspaper, discussion forum, or a magazine. it’s a blog that belongs to Nati alone. it’s her “property” in a sense. she is gracious enough to make it public and share is with us, but that doesn’t and shouldn’t compromise her ownership of it. therefore, she has the complete right to set certain guidelines and “rules” for what’s acceptable and what’s not acceptable to post here. she made it clear several times that she doesn’t appreciate negative comments and even suggested the refrain from visiting this blog if one can’t help him/herself. it’s like someone entering your home and cursing the **** out of you. while they have the freedom to say what they want, it is still extremely rude. Emily, i believe you are heavily mistaken freedom of expression, of opinion sharing and even if it is opposite opinion giving, with pure hateful, negative comments with the only purpose to spread hate. There are a lot of blogs that allows that out there, you can totally go thee and allow this blog to be for the many many ladies out there who are self-confident, who do not feel any threat by Amal’s existence, who are professionals as well and understand deeply what Amal inspires. Of course nobody is imposing anything upon you, but please accept the fact that no every one feels good about being so petty, negative and judgmental over people we dont even know. Christine Lagarde is really rocking it tonight wearing a biker jacket and statement jewellery to negotiatiate with the Greeks about their debt crisis. 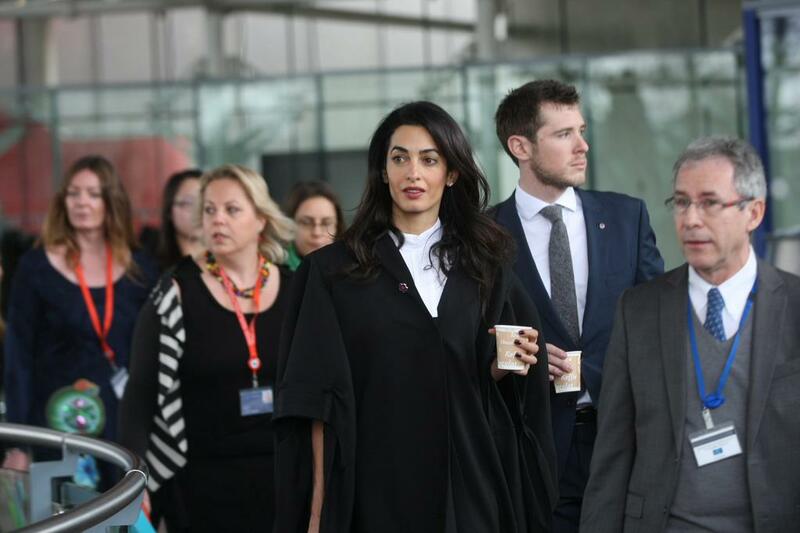 Another lawyer – like Amal – who combines great intelligence and style. Yes, exactly ! A power woman. PS I apologise for my typo! Should be negotiate. Claudine agree wiyh you !! Unfortunately here’ you can not’ write what you think , if you criticize Amal censor !!! I have never been rude I only criticized Amal but never offend but Nati many times has censored my comments !! I insist that this is’ a pubblic blog and also the criticism should be accepted !!! And’ pathetic dear Nati threaten every time not to publish comments if they are not to your liking……. and’ really pathetic !!!! Pathetic is your attitude and if you are so unhappy on my blog, can you explain why are you following Amal ? The comments on this page ? Nati Please, dont belittle yourself by even replying or posting anything that either Sabrina, Emily , Claudine or any other of their kinds, because it is not worth it. They have NOTHING intelligent, positive to express. Please dont even allow them for even a second …and dont worry you will have plenty of nice visitors to your blog. The world is mostly full of good people. The contrary is delusion of the sick, hateful mind who is working incessantly to spread hate, pettiness. These hateful commentators do not deserve a second of your time or mine or anyone’s time and attention! Keep them out! Look how much effort it takes to make them reason on the good side. They wont, they dont get it, they never will get, it is waste of energy. The best way to deal with them is to IGNORE them. As Amal herself does. That is why i admire her, she is above all these pettiness as anyone should! Nati I have explained many times, I’m sorry but you do not understand !!! Yoy’ re awfully boring…………you tell just because ‘ are here if you do not like Amal??? How boring !!!! Sabrina! you can’t just impose your self on a site that dedicated to amal’s fans and spit your hateful comments on every body! it is rude , you probebly an unsatisfide woman in your life ! you must be ugly to a point that you can’t find any man interested in you! after what i raed your comments i trully don’t blame them, go get a life hunn. Vero, ther best ways to deal with such low class, petty haters such as Sabrina, Claudine, Emily and the one BELOW you is to ignore them. They hate that, because they feed themselves from whatever little attention they can get from the world, because they have nothing to be proud of inside them. So lets just ask Nati to not post such haters comments, or her blog will become infested with these disgraceful haters. The best thing is to spend our energy convincing Nati that there is not such a thing as giving freedom of expression to haters or idiots. They deserve NONE! If this blog was mine i would NOT allow any hater comment, not even for a second! I’m afraid the defenders are far more vitriolic than the critics. She seeks and uses Kim K’s beauticians when in America. The above all indicate a person who is perfectionistic and possibly insecure in their previous self. As to holding her hand through her work, and “doing all the work” as a junior lawyer… I do not think she wrote “An inconvenient genocide”, rather, she plagiarised her written notes that she read put in court and when called to shorten her speech she was flummoxed – even her gentle supervisor tried to save her to no avail – as for GR’s ongoing grace, please refer to this link and let me know whether Amal’s ideas on the hooded men will differ from the thoughts already espoused by those, with truly, an intellectual mind. All the best with this blog Nati, but I’m afraid Amal’s obsession with fashion and her new found celebrity status is not a professional strength. @Lawyer! what kind of lawyer are you? it seams like you have nothing to do except stolking Amal! go get a case somewhere hang out in wallmart maybe you will find a case to law your iq in! stop spreding rumers about amal becouse every thing you said about her is not true, i know for fact. NATI i will not come by your blog any longer if you will keep allowing haters to come here to vent their negative pettiness. It was fun coming here to have a good time, but now, it is becoming offensive to anyone with good self-esteem and self respect to read such insulting garbage. Instead of paying attention to the goods that your blog has to offer, one is now stopped at the “door’ to read such hate crap from certain commentators. I totally agree with you Nati, rules of moral conduct and netiquette have to be respected, no question. Vulgarity or rudeness have no place here. I am just astonished how many readers vigorously attack anyone who expresses any critical remark, saying these people have low self esteem and are just jealous and spread hate, repeating the words “hate” and “negativity” quite often. Being critical does not equal spreading hate. I guess most of us agree that Amal is an extremely respectable woman and a great role model. In my opinion she’s balancing quite gracefully on this thin line of being a professional lawyer who is thrown into a sudden interest frenzy and media attention. But as other people have stated here before, it can’t be in her interest if her image flips from high power attorney completely and merely to style icon who wears pomegranate coloured coats and countless different handbags. It’s a delicate balance I hope she can continue to hold; I enjoy how she’s managing and I am glad for her success. But as the smart woman I guess Amal must be I think she herself would appreciate critically thinking women and not just unconditional admirers. That’s why I like the whole picture in your blog. Well done. Well this is a blog designated to Amal, so of course you will be attacked if you express any critical remark. try visiting a Beyonce blog and dare to write an critical note. you wont exit the blog alive! 😉 I personally will accept a critical comment if i see some classiness and intelligence in it. Amal is indeed walking a fine line, but till this day, she didn’t commit anything that deserves such negative remarks from some people. the problem is that I can’t differentiate between the hateful comments from George Clooney’s crazy fans( he has some very very mentally impaired fans, check his imdb page if you dare :scream:) and the critical comments from regular people. That is NOT how your other post was Miss Claudine. But since now you seems to have upgraded yourself, than your post would be ok to read (this one now not the previous one) . My offense is always of people who have nothing positive to say. One got to find at least one positive thing to say of three negative things …at least one. Follow that rule ( or do even better than that) and your comments wont have such backlash from lovers. Dear NATI , as much as i love your blog and appreciate all that you do to keep us informed about Amal, i will not come by your blog any longer if you will keep allowing haters to come here to vent their negative pettiness. It was fun coming here to have a good time, but now, it is becoming offensive to anyone with good self-esteem and self respect to read such insulting garbage. Instead of paying attention to the goods that your blog has to offer, one is now stopped at the “door’ to read such hate crap from certain commentators. It makes me feel very very mediocre to even be spending my precious time responding to such negative and hate fed comments. I most of the time avoid reading most blogs online because of the amount of negativity, speculation, pettiness and mediocrity that is out there. One needs to keep the mind and heart protected from such bombardment of negativity in this world. So i am stepping out, until you decide what type of blog this will be:) You have my email, if you decide to stand by a nice clean of haters blog, ( and when it will be more clear to you the difference between good criticism and good opinion giving from commentators, and just blunt negativity venting with hate spread intentions) please let me know and i will come back. 🙂 Otherwise i prefer to spend my time doing something more gratifying. I am not a masochist to be be enjoying being bombarded with such negativity. Dear Milli, I have done some modifications in the discussion thread, I hope it will quiter in the next days and weeks. I really appreciate your comments. I hope to see you again very soon and wish you all the best.